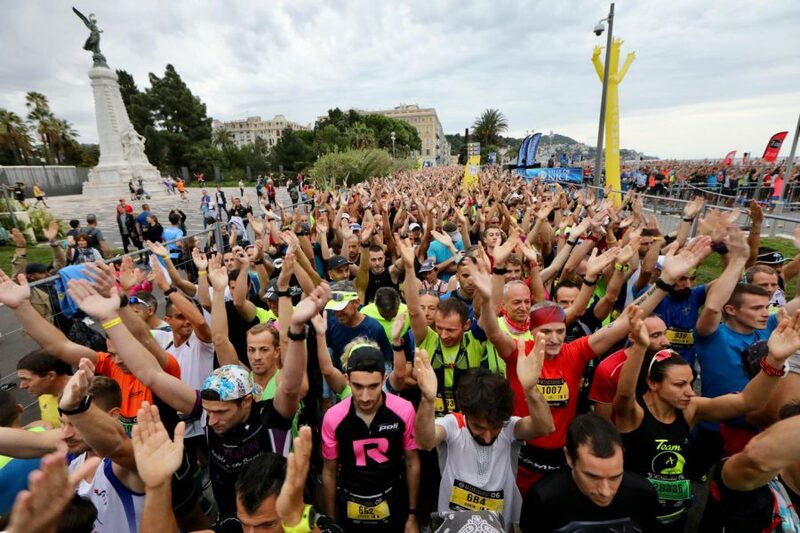 Each year, when the Nice-Cannes marathon takes place, I mull over whether or not I should train for the following year’s race. This lasts for all of ten minutes before common sense asserts itself. More so since I’ve learnt that 5 hours is the cut-off time! This year however I really felt part of the action as my beloved’s niece stayed with us and took part in the race. This is the relative for whom I recently made a wedding cake. She came with five friends, one of whom stayed with us while the other four were in a hotel in Nice. 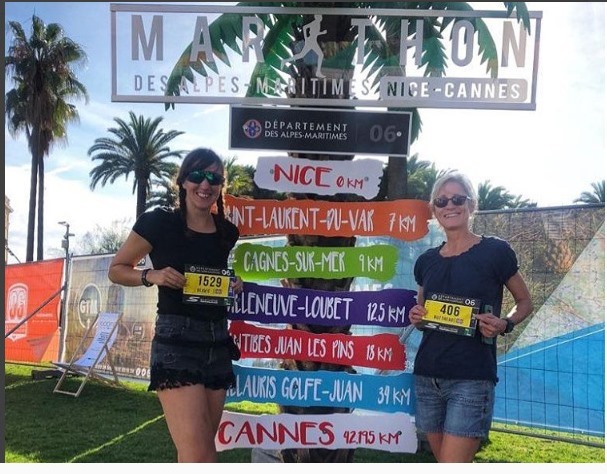 These ladies are seriously good runners with marathon times ranging from 2:45 – 3:45 hours. The girls arrived Saturday lunchtime and, having checked their dietary preferences beforehand, prepared their meals and snacks accordingly. They all carbo-load before the race but eat normally the day before. I knew that all these long-legged gazelles would have hollow legs and, if I wasn’t careful, eat me out of house and home. When mealtimes are uncertain, I ensure I have dishes that can happily sit and wait at room temperature or be cooked at the last moment. I also made sure that I had plenty of snacks to hand for them to eat, particularly directly after the race. To be fair the catering wasn’t too onerous: lunch and dinner on the Saturday (the day before the race), early breakfast and lunch on the day, plus post-race snacks and finally breakfast on the Monday. The rest of the time, the six were out enjoying themselves in Nice. And, aside from the snacks for six, I was only catering for an additional two. The week before the race we’d had torrential rains and high winds which had whipped the sea into a maelstrom, depositing tons of stones and sand on the coast road where the race largely takes place. Fortunately, the weather was fine on the week-end of the race – aside from the persistent cross or head-wind – and probably warmer than expected. They arrived at lunchtime on Saturday, ate lunch, dropped off the luggage and headed into Nice to collect their numbers etc I’d made a cheese and onion quiche for lunch which I served with variety of salads. My beloved adores my quiches but I rarely make them unless we have company, otherwise he has to eat all of it and you really can have too much of a good thing. Dinner was a vegan shepherd’s pie with lentils and mushrooms, not lamb, topped with sweet potato. Dessert was vegan rice pudding with raspberry compote. I rose early on Sunday to prepare their respective breakfasts and post-race snacks – egg sandwich for one and porridge for the other. I think it’s important to have a routine and eat the same thing before a race so that there’s less likelihood of tummy troubles. I watched the MotoGP races from Malaysia – now you know why I didn’t mind an early call! Later I watched the runners stream past on the coast road from the relative shelter of the terrace. At that distance, even with my binoculars, I couldn’t pick out the girls as, only just over 10km from the start, the leading ladies are still quite tightly bunched although it does take a while for everyone to thunder past. Had I been watching from the roadside, I would have given plenty of encouragement to the tail-end Charlies, I know what that feels like. In no time at all they were back demanding to be fed lunch. I’d whipped up an Italian style take on my Sunday roast serving the roast beef with polenta, wild mushroom sauce and spinach, followed by bread & butter pudding. Much to my beloved’s dismay, there were no leftovers. Those girls had worked up a serious appetite! This probably stood them in good stead for a night out in Nice. Monday they ate a copious breakfast before leaving for a post-race hike in the nearby hills before flying back that evening to Blighty. It’s always enjoyable having house guests, particularly those that entertain themselves. As long as I know when, what and where they need feeding, I’m fine. We had ours last week here in Vannes, I just watch , from my company we had like 15 participating and of course eat and drink afterward, that was my take lol!!! I’m trying to comment on your Aperol post but keep getting “Oops that page can’t be found”? Yeah, I sometimes encounter that problem on other people’s sites too. Wait 5 mins and try again. I suspect you were too quick off the mark! Nope, no change! I got an email with the full post in it, but clicking on like or comment just gives me the “oops” message. Oh no! Don’t know what to suggest.